P.E.A.C. Chairperson: Fr. Paul Paradis, I.V.D. In 1921 the Franciscan Fathers came to Blue Bell and replaced Fr. Félix Dugal of St. Michel (Drummond), while he was on a trip to Europe. It was probably at this time that plans were made with Bishop Chiasson, then Bishop of Chatham, to take over the Indian Reserve at Maliseet, and the surrounding missions. Father Hugolin Lemay O.F.M. and his brother priests, Father Sylvestre Beaudet and Father Raymond Pennafort Willy were the first Franciscans in the area. Assumption Parish Blue Bell already had its little church which was built during the time of Fr. Frederick C. Ryan. It was through the hard work of this priest and the charity of Mr. Joseph Deleavy that the church was built. During the construction of the C.N.R. railroad, the Blue Bell "track" was opened to pioneers who came and made their "homestead" there. With the inauguration of the railroad, new industries came into the area, such as M.O.B Davis, from Tie Camp; Lebel of Bell Grove; and Carl Jensen of Annfield. Those forest industries brought people into the area; they became the founders of Blue Bell parish. The name "Blue Bell" comes from a mountain peak situated at Bell Grove, whose summit is blue. The moment the sun rays shine on it, it takes on the form of a bell resting on the ground. The name Blue Bell was also used for the main street, the post office and the train station not far from where the church is situated. 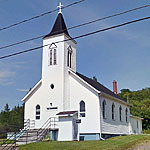 The church itself was dedicated to the Blessed Virgin Mary and given the name Assumption, and is commonly known as the Blue Bell Catholic Church. Some of the first pioneers, like the Deleavey's, Belmoyne, Decieco, etc. and many Acadian families from Abraham Geneau and Léandre Arsenault and others came from the neighboring parishes of Drummond and Grand Falls or Madawaska County like the Levesque's, the Michaud's or the Morin's. The section actually constituting the sanctuary and sacristy was the first church of Blue Bell. Mr. Joseph Deleavy went from house to house to raise funds to build that part of the church. When Father Sylvestre was called to serve Blue Bell in 1921, he found the church too small for the population and organised work bees to get an addition built on. The actual foundation was not finished until 1939. The floor above the sacristy served as the parish hall, then was transformed into rooms and finally the rectory. It was Father Hubert Perron who put in the water system that is still in use by the rectory and church. From these pioneer days the parish has grown into a beautiful community. At the present time there are about 200 families who are considered parishioners. Much work has been accomplished in the last ten years, both spiritually and materially. Many visitors from Canada and the United States visit this little church and leave with the same impression: It looks like the church of "Little House on the Prairie".